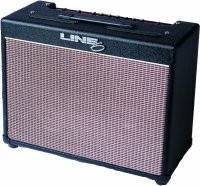 Products: View the Line 6 Modeling Amp products. Amps: Get info on all the modeled amps that POD, POD Pro and Flextone II offer. Patches: Download over 400 patches for POD, POD Pro and Flextone II. FAQ: Check here for answers to your technical questions. Community: The web's greatest resource for information, patches, soundbytes, and reviews. POD Studio: Download recording specific patches in the studio area. POD - The ultimate direct recording box. It gives you access to 32 of the worlds most sought after sounds to play with. From vintage Fender Twang to the modern crunch of a Mesa Boogie Dual Rectifier Head you can have it all. In addition to the 32 amps modeled you get 15 speaker cabinet simulations. Want to plug that Soldano 100 watt head into an 8" speaker from a 1960 Fender Champ? Go for it. Line 6 gives you the flexibility to shape your tone the way you want it. You'll also get effects. Not sterile sounding rack effects. But eight guitar specific effects modeled after classic stompboxes. You'll have the Roland CE-1 chorus, an ADA Flanger, original Vox wah, a classic Fender optical tremolo circuit and other great vintage effects. In adddtion you get digital and spring reverb as well as digital delay effects. Experience POD today and start a new era of inspiration in your playing. 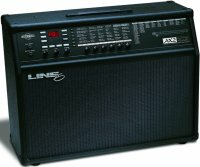 Don't forget to check out all the modeled amps here. Be sure to stop by the Patches area to download over 400 patches that you can use with your POD. POD Pro - Take all the magic of POD, add a batch of digital and analog I/O options, stuff it in a rack mount box, and you have POD Pro. Same great tones in a new package! Be sure to stop by the Patches area to download over 400 patches that you can use with your new POD Pro! Flextone II - With the Flextone II you get all the great tone shaping capabilites of POD packaged into the worlds most flexible series of combo amps. The basic Flextone II gives you 60 watts of power into a single 12" speaker. Or you can step up to the Flextone II Plus which gives you the option to run 100 watts stereo with an extension cab. And for those who need the ultimate, there is the Flextone II XL. The big daddy of the Flextone II series. The XL gives you 100 watts stereo into its two 12" speakers. Be sure to stop by the Patches area to download over 400 patches that you can use with your Flextone II series amp. AX2 - The flagship amplifier of Line 6. This amp gives you 28 amp models, 16 cabinet models to mix and match for your ideal tone, a full palette of rack and stompbox modeling effects and midi connectivity all packaged into the combo amp of your dreams. Two custom 12" speakers are driven by 100 watts of stereo power. In addition to the 128 factory presets you now have access to hundreds of presets at this site as well as all the other patch sites scattered about the web. Head on over to Patchwizard.com to download the POD to AX2 patch converter. This handy utility gives you instant access to all those POD and Flextone II patches. Once you have that little utility be sure to stop by the Patches area to download over 400 patches that you can use with your AX2 series amp. Return to the POD page.